The Fairly Famous Family have been touring outdoor performances for the last 30 years. Through our shows we aim to entertain, inspire and surprise with high quality, original street theatre. ….EXPO Seville, Commonwealth Games, World Student Games, Euro 96, Rolling Stones UK Tour, Glastonbury Festival, Festimagic France, Stockholm festival, Linburg Festival Holland, all over Belgium (we are big in Belgium! ), Tall Ships Race, Edinburgh Festival, G8 Summit, Eurovision Song Contest… and The Isle of Man! We have appeared on television in the UK, Ireland, Canada and the USA. Highlights include the ‘Stars in Their Eyes‘ European final (with our cheesy opening routine!) and Cumbria’s very own ‘North West Tonight’. The Times, The Telegraph, The letters page of Woman’s Own, The back page of The Guardian, and page 3 of The Sun! 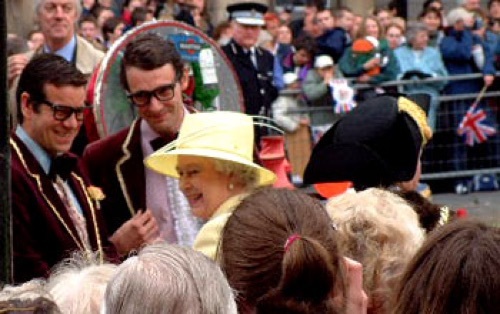 The Queen (see below), Princess Anne, Prince Andrew… and even Jim Bowen. The Queen: Have you been waiting long? Jem: Yes, since this morning. The Queen: What are you doing here? Kyle: …Giving fashion advice. And as you know yourself Your Majesty – if you’re looking good, you’re feeling good. The Family has been growing for 20 years and along the way we’ve collected some fine specimens… From head honcho Jem Famous, down to the bloke who once fixed a puncture on the van (ok, well not quite that far…) we’d like you to meet the faces who make up The Family, and discover what makes them tick. Because really, what type of person lies awake at night trying to figure out the best way to shoot toilet rolls over a crowd of 200 people? !